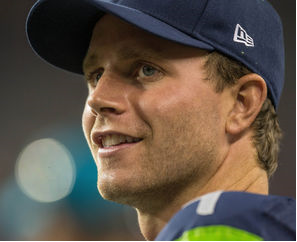 RENTON – His Seahawks teammates say Steven Hauschka takes a rather clinical approach to his craft. Makes sense, considering he spent most of his college years thinking he’d make his living fixing teeth rather than kicking footballs. His mom and brother are dentists. And during his years at Division III Middlebury (Vt.) College, where he also played soccer, Hauschka assumed dentistry was his destiny, as well. Hauschka’s path began to change, though, when some of his roommates at Middlebury who were on the football team asked him to try out as their kicker. That was during his sophomore year. Flash forward a decade, and the 28-year-old Hauschka is among the best kickers in the NFL. This season, he was an alternate for the Pro Bowl and set a Seahawks record for points in a season by a kicker with 143. He was 3 for 3 on field goals in the wind and rain at CenturyLink Field in Seattle’s divisional playoff win over New Orleans last week. “When we say ‘Hausch Money,’ you know what we’re talking about,” Carroll said. Hauschka took a winding road to this point, having never played football at any level until his sophomore year at Middlebury, which has an enrollment of about 2,450. After earning a degree in neuroscience there, he contemplated his future. With one year of eligibility left, he sat down and compiled a list of roughly 30 schools that had lost their kickers or had struggled in that area the previous year and contacted each one. Only two responded — North Carolina State and Northwestern. N.C. State was close and willing to work to get him into school as a walk-on. That fall, as a 22-year-old already holding a four-year degree, he found himself on a dorm floor with every other first-year football player, including a freshman quarterback named Russell Wilson and a freshman lineman named J.R. Sweezy. He made 16 of 18 field goals in his lone season at N.C. State, and was named a finalist for the Lou Groza Award, given to college football’s best kicker. The fate of all but the elite of the elite college kickers, though, is to be left fending for an NFL job as a free agent. He was signed and cut by Minnesota in 2008. He was signed and cut and then re-signed by Baltimore, where he ended up kicking in nine games in 2009. After a few untimely misses, though, he was cut late in the season, which he considers a turning point in his career. At Minnesota, veteran kicker Ryan Longwell, who played 15 seasons in the NFL, told Hauschka the key to success was being able to treat a game-winning kick on Sunday as no different than a practice attempt on Wednesday. It was after his tenure with the Ravens that he decided to fully buy into that philosophy. He later had stints with Atlanta, Detroit and Denver before Seattle called him shortly before the 2011 season, seeking a successor to Olindo Mare. At age 26 and already signed and released by five teams, it all clicked for Hauschka in Seattle. He made 49 of 57 field goals in 2011 and 2012, but was just 3 of 8 from 50 yards and beyond. So he decided after last season to alter his offseason program to strengthen the core of his body and start kicking earlier in the offseason. It’s paid off this season. Including the playoffs, he is 36 of 38 on field goals, one of which was blocked at Indianapolis, and 3 of 3 from 50 and beyond, booting overtime game-winners against Houston and Tampa Bay. He’s also a three-handicap golfer, a sport whose approach Wilson says complements Hauschka’s field-goal kicking. And while his early NFL struggles are a reminder of how tenuous the fate of a kicker can be, Hauschka also says those experiences made him the kicker he is today. From Steve Corkran's "49ers notebook: San Francisco 49ers close to full health for showdown with Seattle Seahawks"
The 49-yard field goal by Phil Dawson in the first quarter against the Panthers is the longest in franchise postseason history. Dawson eclipsed the mark set by Wade Richey on Jan. 3, 1999, against the Packers. Dawson is 6 for 6 on field-goal attempts so far in the playoffs and 38 of 42 overall this season, his first with the 49ers. Dawson, 5-foot-11 and 200 pounds, is in his 15th NFL season. Dawson credited, in part, playing offensive tackle in high school for his success as a kicker in college and the pros. "Being severely outmanned physically, I had to learn attention to detail just to survive," Dawson said. "That discipline paid off because I now play a position that requires that same attribute." From Michael David Smith's "Wednesday morning one-liners"
If the Saints do whatever it takes to keep TE Jimmy Graham, will there beenough cap space to keep RT Zach Strief and S Malcolm Jenkins? Tampa Bay fans are seeing LeGarrette Blount, Aqib Talib and Michael Bennett play well in the playoffs and thinking, the Bucs sure could use players like that. The Cardinals would hate to lose free agent LB Karlos Dansby. Rams LB Alec Ogletree and PR Tavon Austin made the all-rookie team chosen by the Pro Football Writers of America. The 49-yard field goal by 49ers K Phil Dawson against the Panthers was the longest in franchise postseason history. Here’s a Seattle columnist going back and forth on whether the Seahawks will beat the 49ers. The Kansas City Chiefs placed a league-high three players - running back Jamaal Charles, safety Eric Berry and punt returner Dexter McCluster - on the 2013 All-NFL team, chosen in voting conducted by the Professional Football Writers of America. Only five players from the PFWA's 2012 All-NFL team were repeats: Denver Broncos quarterback Peyton Manning, Detroit Lions wide receiver Calvin Johnson, Houston Texans defensive end J.J. Watt, and two players from the Seattle Seahawks, cornerback Richard Sherman and safety Earl Thomas. Johnson is a member of the PFWA's All-NFL team for the third consecutive season, the longest current streak. Manning was voted All-NFL by the PFWA for the seventh time in his career and Cleveland Browns offensive tackle Joe Thomas earned his fourth career All-NFL selection. A total of 17 players, including Minnesota Vikings rookie kickoff returner Cordarrelle Patterson, were first-time All-NFL honorees. Nine clubs - the Arizona Cardinals, Carolina Panthers, Cleveland, Denver, Detroit, Philadelphia Eagles, St. Louis Rams, Seattle and Tampa Bay Buccaneers - each had two players on the All-NFL team. In all, 16 clubs are represented among the 27 players honored. The PFWA also announced the All-AFC and All-NFC teams. The Chiefs led all AFC teams with seven All-AFC selections, while the Browns had five All-AFC honorees. The Seahawks led all NFC clubs with four All-NFC selections, while the Panthers, Eagles and San Francisco 49ers each had three All-NFC honorees. With Bill O'Brien's future at Penn State reportedly up in the air, the name most Penn State fans should know is one that has only recently drifted into the picture: Agent Neil Cornrich. After negotiating a new contract and lower buyout with Penn State, O'Brien parted ways with his former agent Joe Linta and joined forces with Cornrich, an agent who has had his hand in some of the largest college football contracts in the past few seasons. What does Cornrich bring to the table? A stable of coaches who have benefited greatly from his services. Bill Belichick, Bob Stoops, Bo Pelini, Kirk Ferentz, Todd Graham and Bret Bielema all have seen Cornrich's efforts send big dollars their way. Bielema: He makes just over 3-million a year while at Arkansas not including additional income upwards of $700,000. Ferentz: He has a massive buyout at Iowa that has made him virtually untouchable. He is guaranteed 75-percent of his remaining salary if he is fired without cause over a 10-year deal signed in 2010. He makes between 3 and 4-million per season. In 2010 Stoops was the highest paid Big Ten coach in conference history. Graham: Makes just over 2-million per year over a five-year deal. Ron Prince: After getting fired, Kansas State head coach Ron Prince walked away with a 3.2-million dollar buyout despite posting a losing record over his short time at the helm. Kansas State would take Prince to court over the buyout and what lawyers called a "secret agreement" more or less buried in lines of fine print in Prince's contract. And the list goes on and on. Dallas Clark became the highest paid tight end in the NFL under Cornrich in 2008. Mike Wahle the highest paid interior lineman in 2005. But the point remains the same. If O'Brien wants to go to the NFL he will and nothing can stop him. But if he's playing ball with Penn State he has one of the best in the business going to bat for him. The situation right now is murky. ESPN reporters Chris Mortensen and Adam Schefter say O'Brien is in talks to become head coach for the Houston Texans. They are perhaps the best NFL reporters in the business. They also happen to be the same reporters who broke O'Brien's hiring just over two years ago. But as Mike Florio pointed out on Saturday night, not even these reports are always as they seem. "The goal of the leaker could be to help push a deal to conclusion," Florio writes. "The goal of the leaker could be to blow a deal up. The goal of the leaker also could be, quite simply, to curry favor with the persons to whom the information was leaked." If O'Brien is using the leak as a ploy to pressure Penn State for, higher assistant pay, a lower buyout, or any number of items, none of that will be known until the dust settles. O'Brien has even spoken with top recruit Thomas Holley and told him the reports are false. But in the world of recruiting that is far from a guarantee. So how does this all end? With Bill O'Brien coaching somewhere next year, and Neil Cornrich probably getting him exactly what he wants and more. Until then it's just a waiting game. If O'Brien is headed to the NFL that will become public officially sooner rather than later. If he's playing ball with Penn State, that likely won't be public until he and Cornrich get what they want and even then the details may never fully come to light. Ironically, O'Brien may turn out to be what fans once said he would be -- a coach that would put time between Joe Paterno, the scandal, and a high-profile and a long term coach. It just turns out he was particularly good at his job. So the question is, would fans have preferred that he was bad at his job in order to make the transition more pleasing? You have to think not. It may not be fun for Penn State fans, but welcome to the modern coaching world. Second-year player Nate Ebner has become a key special teamer. FOXBOROUGH — For someone who has played no offensive snaps this season and just five snaps on defense, Nate Ebner has managed to make his presence felt. That might seem difficult, but getting your hands on the football during two memorable moments from the regular season is a sure way to get noticed. Ebner has come up with two fumble recoveries. The first led to an improbable overtime win, while the second capped a blooper-reel play that will live in Internet GIF infamy. A soft-spoken second-year player who didn’t play football in high school, walked on at Ohio State, and made his name nationally in rugby, Ebner has capitalized on his limited opportunities with the Patriots. The impact has come on special teams, which is where Ebner has spent most of his time since being picked in the sixth round of the 2012 NFL draft. 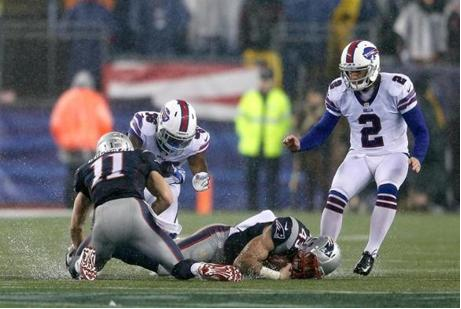 In addition to his two fumble recoveries this year, Nate Ebner secured this onside kick try by Buffalo in Week 17. Fortunately for his teammates and Patriots fans, Ebner was around the ball when it bounced off Denver’s Tony Carter late in overtime Nov. 24. With barely three minutes left to play and punting the ball away, the Patriots seemed to be long shots to win, barring something unexpected — which is exactly what happened. 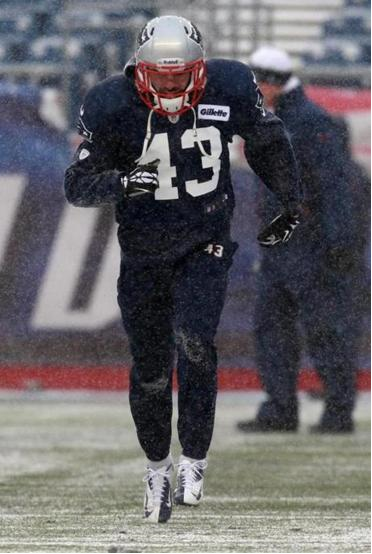 Ebner, despite being the personal protector for punter Ryan Allen, slipped a block and used his speed to be one of the first Patriots downfield. When the ball glanced off Carter’s leg at the 15-yard line, Ebner was there to pounce on it. Three plays later, the Patriots had earned a 34-31 win, after trailing at halftime, 24-0. Three weeks later in Miami, with the Dolphins setting up to attempt a tying field goal in the second quarter, Ebner lined up second from the end, ready to rush. But when Dolphins holder Brandon Fields looked back at kicker Caleb Sturgis, the ball was prematurely snapped, hitting the unsuspecting Fields squarely in the helmet. The ball bounced right toward Ebner, who pounced yet again. The Patriots eventually turned Miami’s blooper into a touchdown. In addition to the two fumble recoveries — the first of his NFL career — Ebner also made 11 special teams tackles. (Also a safety, he played three snaps at Carolina, and two snaps at Houston.) His instinctiveness, both from the recoveries and tackles, is evident. It might look natural, but Ebner said he feels much more comfortable now that he’s no longer a rookie. He put up solid numbers last season (17 special teams tackles), but spent much of the time simply making sure he was on time. “I’ve learned so much from last year to this year. Your rookie year, there’s so much to learn, it’s getting acclimated, it’s a grind, it’s nothing you’ve ever been through before,” Ebner said. “Just understanding what the season has to offer, understanding the grind, understanding how we do things here, that’s definitely been easier for me. This season, like last, has brought the Patriots into the playoffs. They have no game this weekend, courtesy of their first-round bye, and will host a division-round game on Jan. 11 against either the Bengals, Colts, or Chiefs. That gives Ebner at least one more chance to make some noise. Which is exactly what he’s been asked to do. A quintet of Rams players were honored on Monday as the club announced their 2013 team awards. In a vote amongst Rams players, Quinn received the Daniel F. Reeves Memorial Award, which goes to the team’s Most Valuable Player. Laurinaitis was named Carl Ekern Spirit of the Game Award winner and Stacy was awarded the Carroll Rosenbloom Memorial Award, which goes to the team’s top rookie performer. DE Williams Hayes is the Rams’ recipient of the Walter Payton Man of the Year Award in recognition of Hayes’ commitment to community service. 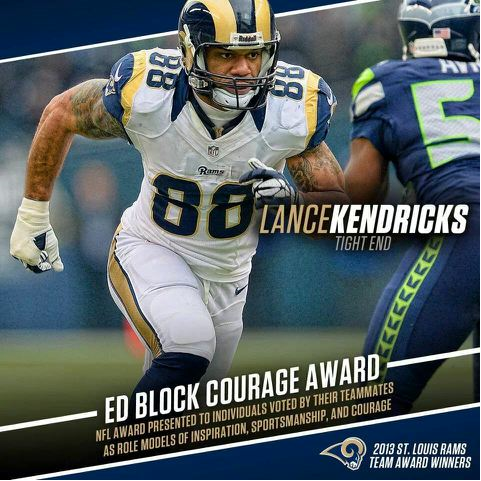 TE Lance Kendricks is this year’s winner of the Ed Block Courage Award, an honor given to a player who had to overcome some form of adversity. This spring, Kendricks aggressively attacked the weight room as he prepared for what he hoped would be a strong third NFL campaign. Early in the process, Kendricks suffered a knee injury, one that required surgery to repair his meniscus. The injury was expected to keep him off the field for four to six months, but Kendricks was determined to return much earlier. Through a vigorous rehabilitation program, Kendricks was back on the practice field by the end of training camp, and when the Rams opened the season against the Arizona Cardinals, the former Wisconsin Badger was in the starting lineup for his team’s Week 1 victory. He caught 32 passes for 258 yards and four touchdowns this season. Six of the eight Seahawks who made the Pro Bowl also made the All-NFC West team, as you would expect, along with two other Seattle players. Middle linebacker Bobby Wagner and kicker Steve Hauschka, who were not Pro Bowl selections, made the all-division team, which was voted on by the four team reporters for ESPN.com. The six Pro Bowlers on the All-NFC West team are quarterback Russell Wilson, running back Marshawn Lynch, center Max Unger and three members of the Legion on Boom -- cornerback Richard Sherman, free safety Earl Thomas and strong safety Kam Chancellor. Sherman and Thomas, two players who will be in the running for the NFL Defensive Player of the Year honors, were easy choices. Chancellor, one of the game's biggest hitters, made it after what coach Pete Carroll said was his best season. Sherman led the NFL this season with eight interceptions. He also has the most interceptions (20) and the most passes defensed (60) over the past three seasons. Thomas had five interceptions this season and is the emotional leader of the Seattle defense. He led the team in solo tackles with 75. Wilson certainly was no surprise with the season he has had in leading the Seattle offense. Wilson has more victories than any second-year quarterback in NFL history with 25. He also is one of only three quarterbacks in league history to throw for more than 50 touchdown passes in his first two seasons, joining Dan Marino and Peyton Manning. Wilson has 52. Lynch rushed for more than 1,000 yards for the third consecutive season and the fifth time in his career. His 1,257 yards rushing in the second-best total of his career to last season’s 1,590 yards. Lynch has the most TDs in the NFL since 2011 with 39, including 35 rushing and four receiving. He has a career-best 14 TDs this season. Also making the All-NFC West team on offense was Unger, who was voted to the Pro Bowl for the second consecutive year. Russell Okung, considered Seattle best offensive lineman and one of the best left tackles in the game, didn’t make the all-division team because he missed eight games with a toe injury. Okung is a Pro Bowl alternate, as is Hauschka and receiver Golden Tate (as a punt returner). Hauschka has made 33 of 35 field goal attempts, but one miss was a blocked kick at Indianapolis. He is 14-of-15 from 40 yards and beyond. Wagner earned his spot with an outstanding second half of the season. He got off to a bit of a slow start this season and missed two games with a high-ankle sprain, but has played the best football of his career over the last seven games. Wagner leads the team with 119 tackles, but also has five sacks and two interceptions. He had 12 tackles in the 27-9 victory over St. Louis Sunday and was a big reason the Rams rushed for only 13 yards. No one made it from the Seattle defensive line, but part of the reason could be that no man plays more than 70 percent of the snaps. The Seahawks have a seven-man rotation up front, but Michael Bennett has 8.5 sacks and Cliff Avril has eight sacks. Released to the App Store January 1, 2014, Ted Ginn: Kick Return is a football game that features full 11-on-11 kick return gameplay with a top-down view and 3D graphics. To succeed in this game players must learn to read blocks and find holes in coverages while following other fundamentals like being decisive and moving “north-south”. The game includes 21 tournaments starting with “ROOKIE”, then moving onto “VETERAN, CAPTAIN, ALL PRO...", each containing increasingly difficult opponents. With every win players earn Game Cash to upgrade their team via the Equipment Store and Free Agency where they can sign new players including the star returner Ted Ginn Jr.
To create this app Ted Ginn Jr. partnered with DoubleTap Software the creators of the popular app Touchdown Run. The result is a kick return game with added strategy and more realistic gameplay while still implementing a unique telestrator-control style. The game is currently available for free on iPhone and iPad and there is an Android version coming soon.